I was born and raised in the Yok'Hah Maya Nahual tradition which is a line of the Mayan tradition based on physical- mental- spiritual discipline and self-awareness. These teachings influenced my daily life. Tlacololero is my traditional Nahual name. It means jaguar hunter. At the age of 18 I left my homeland and started my long journey from Mexico to pursue an academic career in Europe . This was a way to have a better understanding of the western culture. My curiosity towards other mentalities led me to Russia, Spain, USA, Germany and Italy. I became a therapist. I am also interested in performing arts. I staged plays, directed theatre and dance trainings and supervised a variety of groups as a trainer. My work led me to many other countries of Europe and South America. Guided by my interest in the magical traditions of Europe I came across Stregoneria (Italian Witchcraft). This tradition originated from the pre- Etruscans (c. 800 BC) and its knowledge was later adopted by other cultures, such as Celtic, ancient Italic, Persian and Roman. Thirteen years ago I received the permission of the Nahual Woman (Master of the Yok `Hah Maya Nahual Tradition) to teach this Tradition in Europe. In 2008 the Nahual-woman officially recognized me as a Master (Nahual-man). 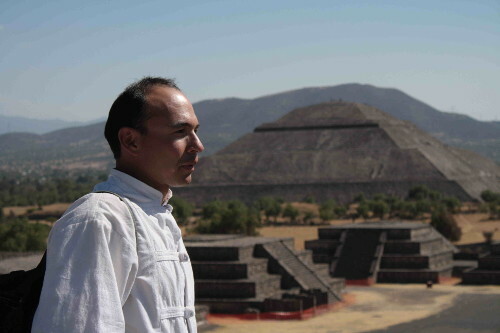 In March 2011 I was for the very first time in the history of Mexico, officially designated by the Elders Council as Ambassador of the Mexican Nahual Traditions abroad.This is not an achievement, it is just a passage in my live, a turning point that opens the gate of a new beginning. In the course of my work I realized that many seemingly different methods can easily be combined with each other. I use this kind of flexible integration to liberate potential and creativity of human beings, so that every woman and every man can follow their own path and find their own strength. This way we expand and deepen our abilities and zest for life.